Our Chief Instructor Neil has over 30 years flying experience and has flown everything from a 1930s Bi-Plane to a Supersonic Jet Fighter, he’s been flying since the age of 13 having his first flight in a de Havilland Chipmunk while a member of the Air Cadets (Wideopen, 861 Squadron) going on to gain his private pilot’s licence (PPL) flying aircraft like the Piper PA28 at Newcastle Aero Club. He went on to found the Newcastle Jet Provost Group which owned and operated an Ex RAF Jet Provost T Mk3A aircraft, he has been flying the Jet Provost (All Marks) since 1996 and amassed over 800 hours on the type (The highest number of flying hours for a civilian pilot). 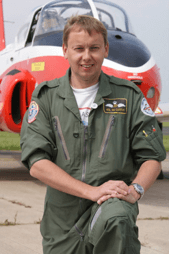 In this time he became the Chief Pilot for the group, a CAA approved Test Pilot and also a “Jet” Display Pilot, he has displayed at airshows all around the UK and Europe and continues to do so. Known for his reliability on the UK air display circuit, Neil is a popular and well respected display pilot and has never missed an airshow booking, priding himself on delivering the safest and highest quality of performance. As well as a Display Pilot, Neil is also a CAA approved airshow Flying Display Director (FDD), He has put together and organised many airshows over the years and also acted as a member of the Flying Control Committee (FCC). One of his highlights as an FDD was controlling the Vulcan Bomber on one of its last ever flights. Over the years Neil has undertook many projects, in 2011 he rescued a de Havilland Vampire T11 cockpit from the scrap man, the project made the national and international news while he refurbished the Vampire on his driveway at home! The Vampire now lives at her new base at the Morayvia aircraft museum in Scotland. 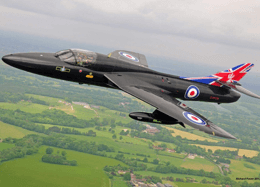 In 2012 Neil underwent conversion onto a Supersonic Jet Fighter the mighty Hawker Hunter Neil flew the Hunter at various displays around the country to mark the Queens Diamond Jubilee with special tail artwork. Also in 2012 Neil was made the UK Ambassador for the European Federation Historic Aviation (EFHA) a position he still holds today, he also helped to form “The SkyLab” charity and was their Chief Display Pilot as well as a trustee for the charity. In 2013 Neil commissioned the building of a full size replica Spitfire MkIIa, RN-N (Ryan, Nathan, Neil) which was a Northumberland based Spitfire during in World War 2, The Spitfire attended many events over the 2013/2014 period and raised a significant amount of money for various charities during this time. 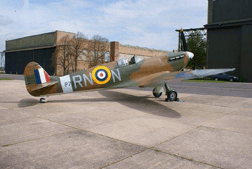 The Spitfire is now based at the Ulster Aviation Society aircraft museum in Northern Ireland. In 2014 and after purchasing a Spitfire flight simulator cockpit, Neil decided that the North East was missing something and wanted to help promote aviation in the region as well as inspire future generations of pilots and engineers, this is where the idea for the Newcastle “Flight Simulator Centre” came from and sent Neil on a search around the globe for some high quality simulators, by the end of 2014 Neil had found a full size Boeing 737-800 Airliner and a F-35 Fighter Jet to join the classic Spitfire fighter from world War 2. In 2015 Virtual Reality Gaming was added to the list, one of the first “VR Centres” in the UK. In 2016 Neil built a single seat full motion simulator with a 270 degree wrap around screen the only one of its type in the UK, This was a universal simulator and could be used as a Racing Car or a Flight Simulator. 2019 will see some major updates to the Flight Sim Centre with both the Spitfire and the Fighter Jet getting cockpit and visual updates and they have just taken delivery of a real Piper PA28 training aircraft which will be turned into a light aircraft simulator offering an introduction to Private Pilot Licence (PPL) training. The Flight Sim Centre (Newcastle) is now one of the largest, most respected and most popular Flight Centres in the U.K. and has won the TripAdvisor “Certificate of Excellence” every year since opening and regularly achieves 5 star reviews on TripAdvisor, Groupon and Google. In 2018 Neil using his significant real life flying experiences setup “Blue Yonder Air Tours” (using a Piper PA32 large 7 seat aircraft so all the family can go flying together) again with the aim of helping to promote aviation in the region as well as to inspire future generations of pilots and engineers and of course allowing the people of the North East to go flying with the Blue Yonder team and see some amazing sites from the air! Everything from Newcastle/Durham or Sunderland City Centre to the Castles of Northumberland across to the Lake District, we are truly blessed with some of the most amazing scenery in the world. 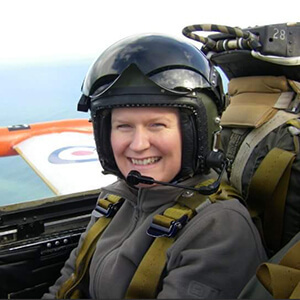 Amanda has had a keen interest in aviation all her life with significant flying and aerobatic experience in the Jet Provost. She has participated in some of the largest airshows in the world including Farnborough, RIAT (RAF Fairford), RAF Leuchars, RAF Waddington, and numerous RAF families’ days. Back in 2003 Amanda travelled on Concorde fulfilling a childhood dream trip of flying supersonic on Concorde to New York and returning on the QE2. Amanda is the Senior Instructor at the Flight Sim Centre and has been since 2015, as well as running the Flight Sim Centre she also owns her own aircraft which she has flown in all around the U.K. and Europe seeing some amazing sites along the way. Before joining the Flight Sim Centre, Amanda was a Project Manager for the NHS, qualified to PRINCE2 Practitioner standards, she has previously worked as an IT Training Manager running Microsoft and ECDL testing centres, regularly presenting to large groups of staff.Amanda also has a degree in Adult and Further Education. The Flight Sim Centre is ideally placed on the outskirts of Newcastle upon Tyne (Between Newcastle Airport and Gosforth) with ample free secure parking. The number 45 bus from Newcastle passes the door, and for a small charge we can even offer a collection and delivery service from Newcastle International Airport the Train Station or Metro Station.